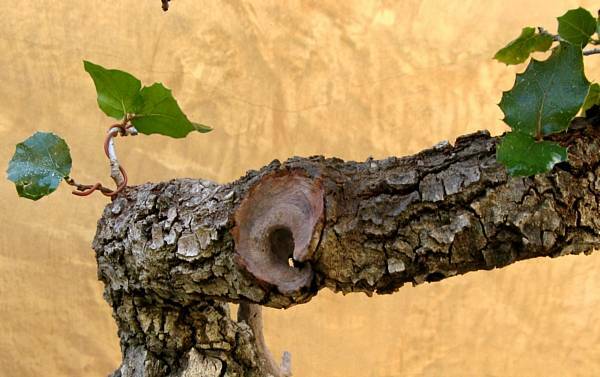 John Naka wasn't only a bonsai artist and painter – he was also a photographer. 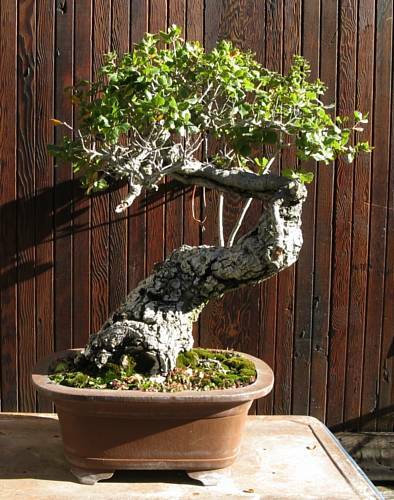 His pictures graced the first twenty-three covers of Bonsai in California, the magazine of the California Bonsai Society which he co-founded. 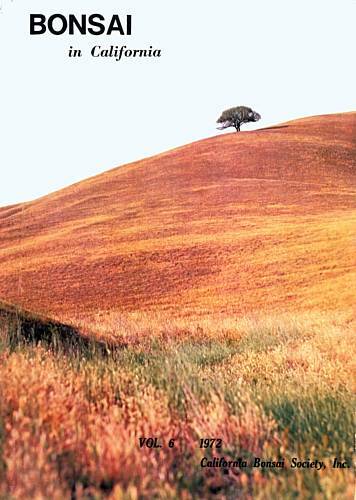 For the 1972 issue, John photographed a lone oak on a hill and wrote a beautiful haiku that was published with the photo. 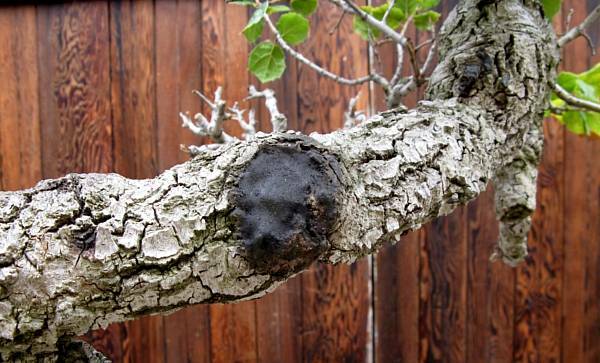 John traveled to central California many times to collect native Coast Live Oaks. 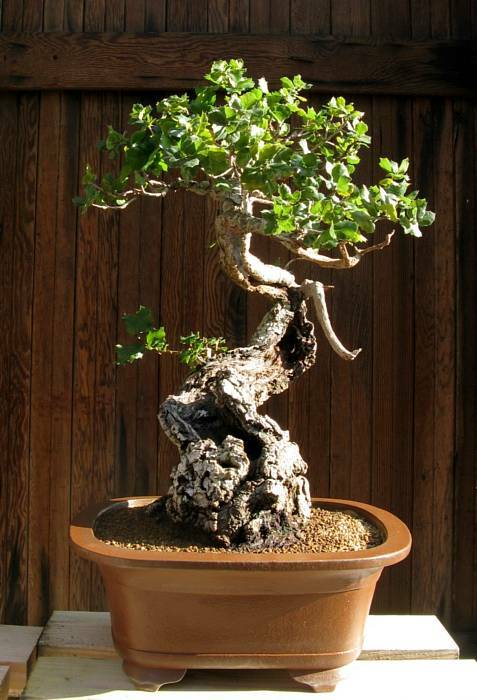 His large cascading oak is now part of the bonsai collection of the John Y. Naka North American Pavilion at the U.S. National Arboretum in Washington, D.C.
John's remaining bonsai now belong to his grandson Mike. 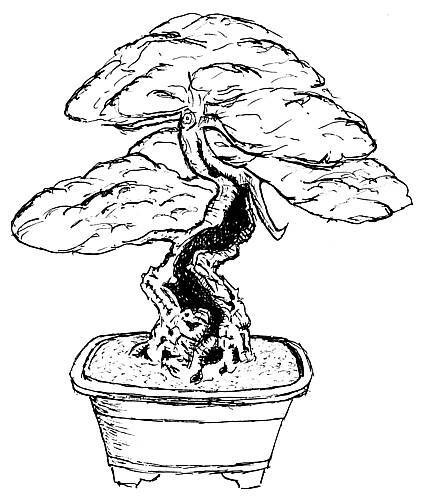 Members of Nanpukai, John's club of select students, occasionally help with maintenance such as repotting. When a tree is in distress, Nurse Manning donates a little extra TLC and hopes for the best. Last year, I donned my scrubs for an oak that was suffering progressive die-back. In April 2004, while photographing the Naka bonsai collection for John and his family, I snapped a picture of the back of this oak. John always placed identification tags behind the trunk, and you can see the round metal tag in this photo. Nine years ago, this oak was lush, with many branches. 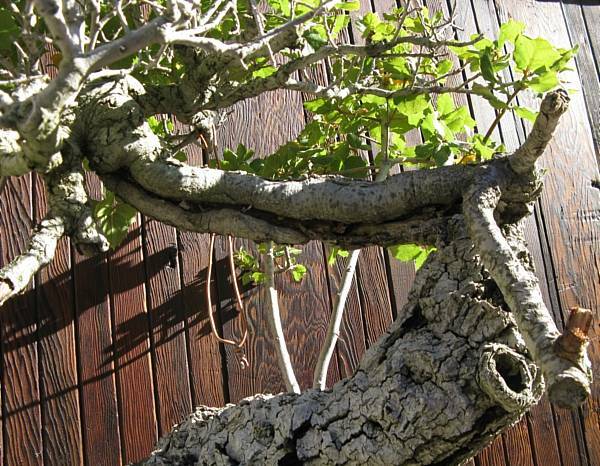 It was planted so the lower trunk was almost horizontal and the upper trunk angled upward. The apex was nearly non-existent; the trunk terminated with two horizontal branches. In 2011, after lower branches died. 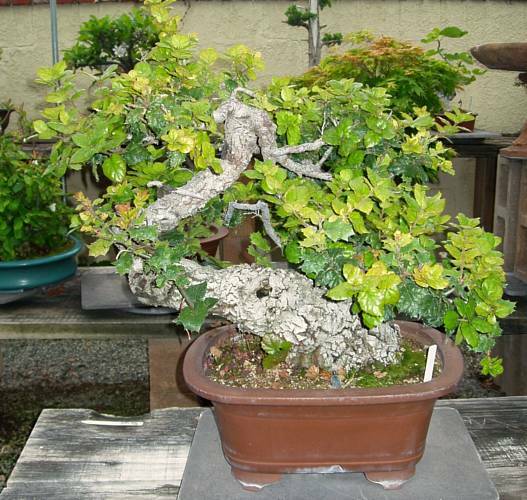 In 2008, Nanpukai members repotted the oak at a different angle. The lower trunk was more vertical and the upper trunk was horizontal. This new position elevated a branch to become the apex. In the years that followed, all lower branches died. When the die-back moved up to the apex, I was asked to find and fix the problem. Dead branches on either end of shari line. The lower trunk had size, movement, taper, and character. After a sharp bend, the upper trunk was linear, lacking movement and taper. I noticed that a thin shari line on the upper trunk had almost disappeared as the tree healed alongside it. That line brought some character to an otherwise uninteresting part of the tree, and it also gave me a hint as to what might be the problem. I examined the old bark on the lower trunk. Some parts were solid and stable. Others felt spongy and moved to my touch. I gently pulled – and a huge piece of the trunk came off. 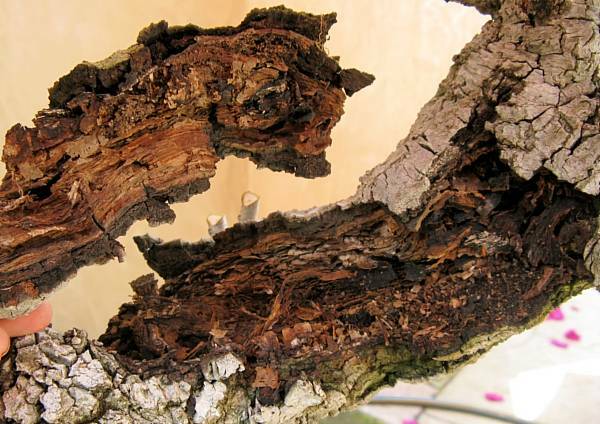 Much of the lower trunk had rotted away. Worms and their castings lined the interior of the base. I removed the worms and loose and rotting wood. When I turned the hose on the tree for a final cleanup, water collected in the base and formed a lake. This was the problem. Whenever the tree was watered or it rained, water entered a hole in the trunk (where a branch had been removed) and became trapped inside. The wet wood rotted and the die-back traveled up the trunk. Big branch cut covered with sealer. Drainage was crucial, so I drilled two vertical holes through the base of the trunk with a half-inch wood drill bit. I trimmed the root pad before repotting it in John's deep bonsai pot. I also reduced the foliage mass by a third to balance the amount of roots removed. In the spring, new growth appeared near the base of the tree, but not on the apex. A large scar on the upper trunk, covered in black tree seal, narrowed the lifeline feeding the apex to one-and-a-half inches. Was this lifeline too little to feed all the foliage above? Reducing length and adding taper with pliers. As the summer progressed, new die-back was nonexistent, but so was new growth at the top of the tree. Perhaps this old oak just needed a little extra recovery time, because in October, an explosion of new foliage filled the apex. New foliage even sprouted on the upper trunk. The new leaves were two to three times the size of the old ones. Once I was sure the tree had recovered, it was time to refine and style it. I began by removing small, dead twigs. Then I fitted my die grinder with a carbide tip to take off dead bark and cambium from the hardwood of the dead branches I wanted to retain as jin. I used hand tools to taper the branches and make them look more natural. First, I made cross-cuts in the end of a dead branch. Next, I grabbed one part of the cut end with jinning pliers and pulled the wood away to create a jagged, tapered end. Branch cut after carving, framed by new growth. The large, round scar on the upper trunk was an ugly distraction. After lifting off the tree seal with a sharp knife, I used the die grinder to carve away tool bite marks. There was one area with soft wood, so I carefully removed it, revealing an interesting hollow. The newly carved jin and shari were amber-colored while the rest of the trunk, branches, and old shari were gray. I didn't want the jin to contrast with the rest of the tree as is commonly seen with junipers, so I tinted the lime sulfur to blend with the natural color of the oak. I mixed white and black gouache with a little water until I had the desired shade of gray. Adding lime sulfur turned the mixture yellowish-green. After spraying the wood with water to enhance absorption, I painted the mixture onto the jin to color and protect it. When it dried, the color was very similar to the bark. Branches were going every which way, including crossing the trunk. Just a few pieces of wire were used to influence initial branch placement. 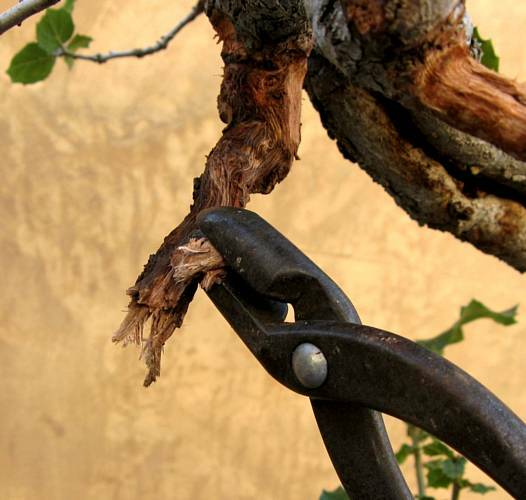 Future branch development will be completed with scissors and judicious pruning. With the loss of the lower branches, the original front no longer looked good. I placed the tree on a turntable and studied all angles. I was mesmerized by the shari and determined to show it off. I also wanted to minimize the long, straight upper trunk while featuring the thin shari line. There was one sweet spot where the sculptural shari was prominent, the horizontal part of the trunk was shortened, and the thick base of the trunk looked dimensional, stable, and interesting. It's just a matter of time before the new branches grow strong and stately. It will be crucial to keep the apex under control during this time so it doesn't overpower the development of other branches. New front with new lease on life. John Naka was my friend and sensei. I was fortunate to spend time with him and watch the transformations he made on bonsai or sketched on paper. I'm thankful for the knowledge and wisdom I gained by his examples. It's always an honor and privilege for me to transpose his lessons onto his trees. With a little TLC, this old oak now has a new lease on life. The beautiful trunk is now the central feature, framed by rich, green foliage (after a few more seasons of growth). In time, this tree will have the majesty and grace of the lonely oak on the hill.